Colony's entry was their famed hot oil and sausage pie, founded on their iconic, chewy-but-crispy-and-flavorful thin crust and topped with just the right amount of sauce and cheese, pock marked by superfluous hot oil bubbling up from the inner sanctum of the pie as well as some delectable DeYulio's sausage from across the street. Reaves: "Great crust, great sauce, great cheese. I could eat this even when I'm stuffed"
Scott: "As expected. Someone sold their soul for this crust recipe, sauce and cheese are mediocre, greasy as ever. A novelty at best." Kait: "Love the crunchy, delicious crust, but way too greasy and very small." Allison: "Wet, messy, and delicious, but I couldn't eat any more [than one slice]." Dan: "Colony is Colony. Not the best pizza I've had from here, though. Also, service sucked, Kait didn't even get a glass." Elliot: "No crunch to this crust, chewy cheese, good sauce, great grease, awful service." As we were waiting the compulsory 30-60 minutes for our single 12" greaseball pie, a member of their horrid, unfriendly waitstaff crept up and perched over Allison's shoulders to tell us that Colony was the best and that we might as well just stop looking. They're not and we didn't. 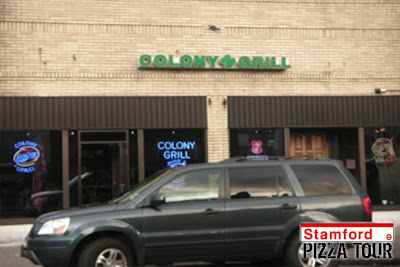 We used to go for pizza and beer at Colony 20 years ago. Never thought the pizza was great then, and still don't. 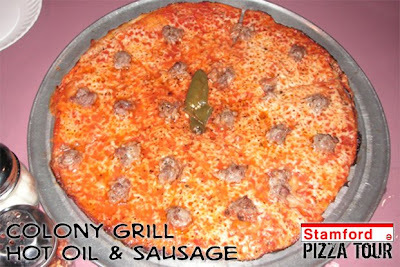 Then, about 5 years ago, I hear people talking like it's as good as Frank Pepe's. Trust me, it ain't, and the place is a dive.